Coach Bridget is a tall and muscular woman. Her hair is pink hair and her eyes purple. She wears a sweat shirt and sweat pants both gray. A whistle hangs around on her neck at all times. To her competitive nature, the coach prides herself of her students being the best of their own physical ability. She often comes as brusque when she wants to motivate them. 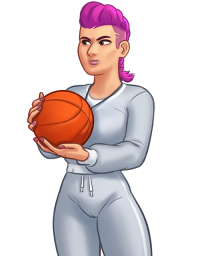 Coach Bridget is the sport teacher at the main character's high school. She has immense pride for the sports she teaches and she won't have lackeys messing that up with under‐performance. Coach Bridget often berates the main character for not doing something simple such as push‐ups well.